Contoh Contoh percakapan bahasa inggris di terminal berikut ini menggambarkan suasana sebuah terminal yang dialami Budi ketika memesan tiket. Setelah memesan tiket, Dalam contoh-contoh percakapan bahasa inggris di terminal tersebut Budi didatangi seseorang yang tidak dikenal mengajak ngobrol dan menawari minuman gratis. Untungnya Eko yang baru saja membeli makan ringan datang dan segera mengajak Budi temannya pergi. Eko menanyakan minuman yang dibawa Budi apakah membeli atau pemberian. Ternyata minuman itu pemberian orang tak dikenal dan dikhawatikan mengandung sesuatu yang berbahaya untuk menipu budi. Budi : Excuse me, Sir. BS : Yes. May I help you? Budi : Yes, Sir. I want to go to Sukabumi, yet I’m not sure which bus I should take. BS : Well, if you want to go to Sukabumi from this station, you then need to take Bumi Putera bus. 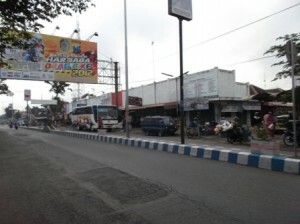 It goes in route of Jakarta – Sukabumi. Budi : Where can we buy the tickets, Sir? BS : You can go there [pointing out at some place], that’s the place to buy tickets. Then you choose the right ticket counter and get into the line according to the bus you are going to take. Budi : Alright. Thank you for the help, Sir. BS : Yes. Be careful on your trip. Budi : Thank you, Sir. Budi : Excuse me. Is this the right bus ticket to Sukabumi? TCC : Yes. How many tickets do you want? TCC : Is it business or executive class? Budi : Business class, please. TCC : The price is Rp. 100,000 for two tickets. You can take the bus tomorrow. Please, come earlier before the bus leave. Thank you. Eko : Oh no, I think we are going to run out of snacks. I’m going to buy some, you want to come with me? Budi : Um… No, I’ll wait here to keep our belongings. Stranger: [suddenly an unknown man sits besides Budi] Hello, where are you going, Kid? Budi : Um… we are going to Sukabumi, Sir. Stranger: We? You’re here with someone? Budi : Yes. I’m going with my friend. Stranger: Where is your friend? Budi : He’s buying some snacks. Stranger: It’s so hot today, huh? Budi : Yeah, it’s really hot today. Stranger: You are going to Sukabumi for what? Vacation? Budi : Oh, no, we’re going to home. Stranger: Oh, I see. So, what have you been doing in Jakarta all along, by the way? Budi : I and my friend were working in Jakarta. Now we are not working here anymore and we decided to come back to Sukabumi. Stranger: I see. Ugh, this weather really makes me thirsty. Hey, I bought some drinks. Here’s for you. You must have been thirsty waiting for your friends. Eko : Budi! The bus has arrived. Let’s get on it. I’ve bought the snacks as well. Eko : You bought that drink? Budi : No, a man gave it to me. Eko : Huh! Throw it off! Did you drink it? That drink could be dangerous! Budi : Oh, my God! [Throwing the drink off] I didn’t realize it. I was too thirsty. Thank you, Buddy. You’re saving my life. Eko : It’s a public place. There are a lot of hidden crimes in here. We need to stay aware. Budi : Right! Thanks again, I don’t know what would have happened to me if you didn’t come at the right time. Throw it off! : buang itu!